Situated ninety miles north of Los Angeles on a narrow coastal plain between the Santa Ynez Mountains and the Pacific Ocean, Santa Barbara is one of only five places in the world where both the Mountains Mid coastline run east and west. Santa Barbara enjoys temperate weather year-round, clean air, miles of' beautiful beaches, fabulous islands, quaint Spanish Colonial architecture and exotic plants from around the world. The earliest inhabitants to enjoy this coastal paradise - the Canalenos (coast dwellers), Or Chumash, for their linguistic groupings, lived in this region for over 10,000 years in harmony with the rich abundance of nature all around them. They subsisted on acorns (of the indigenous oaks), small game and a rich assortment of marine life. They wove watertight baskets which they used for all domestic functions made Stolle implements and lived in grass hut villages. The Chumash constructed plank canoes, or tomols. from driftwood coated with natural asphaltum which seeps from rich petroleum fields far below the ocean. It was in these canoes that crews navigated across a sometimes dangerous strait to the Channel Islands, some ten miles offshore These islands still welcome visitors today, but access by powerboat or helicopter is infinitely faster and safer. An 1890s photo shows "El Cuartel," a former presidio barracks. America's rich and famous bought property in adjacent Montecito and built baronial estates with exotic plants from around the world for their gardens. Today, visitors may tour several of these grand estates to glimpse Santa Barbara's "gilded age',: Casa del Herrero, designed by local architect George Washington Smith with later additions by Lutah Maria Riggs and Joseph Plunkett; opera diva Ganna Walska's Lotusland; and Val Verde (to open soon). The far end of the Casa del Herrero's garden axis. 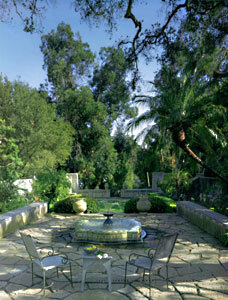 Since the 1925 earthquake, concern for preservation and reconstruction has become part of the Santa Barbara ethic. The only original part of the Presidio remaining, known as El Cuartel, was threatened by construction of the post office, but was saved by preservationminded citizens. 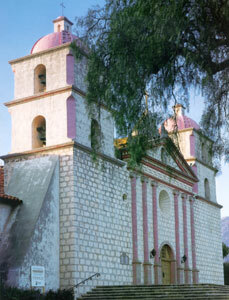 The "Historic Adobe," which has been moved, now resides safely on the grounds of the Santa Barbara Historical Museum where it is leased by the Rancheros Visitadores. It is adjacent to the original Covarrubias Adobe, constructed in 1817 on the site.